(Cervus dama) Unlike many deer, the Fallow deer prefer to go under an obstacle rather than jump over it. The fallow deer in our care were confiscated by Fish and Game from someone who had them as pets. They are now dependent on humans for their food and will live out their lives with us. What does the fallow deer eat? The Fallow deer are herbivorous grazers. They eat grass, leaves, acorns, sweet chestnuts, young shoots, heather, cereals, bark, herbs, and berries. The average life span of Fallow deer in the wild ranges between 12 and 16 years. The longest recorded life span of Fallow deer is 25 years in captivity. How many fallow deer can be born at a time? Generally, only a single fawn is born, although twins are not uncommon. Originally a Eurasian species of deer, the Fallow deer is now widely scattered throughout Europe and a vast region of Asia. It is also found in some parts of the Middle East, the Mediterranean, and a few areas of the United States. Fallow deer have very sharp vision. They can see the minutest details at great distances. The species tends to separate into two groups: one consists of females and their youngsters and the other consists of the juvenile and adult males. The two groups will mix freely but get close only during the breeding season. 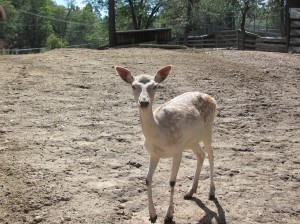 The Fallow deer have two different color phases; a summer phase and a winter phase. Taffy and Nougat – In 2004, these adult female fallow deer were confiscated by Fish and Game from someone who had them illegally as pets. Taffy is the most curious of all the Fallow deer, and has the sweetest personality. Godiva – is a female that was born that same year.